Every month you have the potential to save thousands of dollars. Every month you have the opportunity to make a difference. Econofrost night covers provide unbeatable thermal protection for perishable items within open refrigerated display equipment. 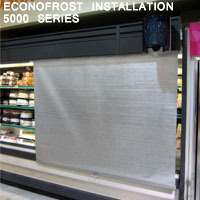 Furthermore, Econofrost night covers generate significant energy savings helping you to lower your utility expenses and minimize your store's impact on the environment. Supermarket covers are ideal for a variety of display cases including; merchandisers, multi-deck lineups, coffin and wide island freezer cases. 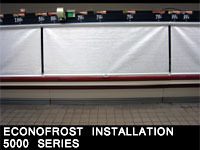 Econofrost motor driven night covers are also available for applications such as meat prep rooms, service areas and long lineups of cases. Installing night covers is one of the most effective and simplest ways you can save money and reduce energy consumption in your operation. 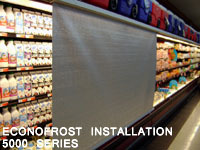 All Econofrost night cover products are engineered to withstand the daily stresses of the supermarket environment and provide retailers with a durable and sustainable product that lasts for years!